It might be blistering cold outside, but that doesn’t mean we can’t bring a little spring into our lives. 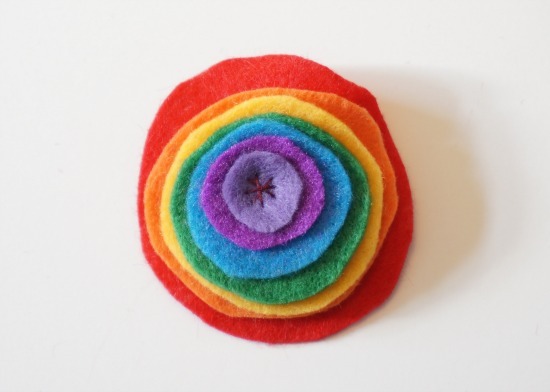 A colourful felt rainbow brooch is a simple way to add some brilliant colour. I love making brooches for my coat. 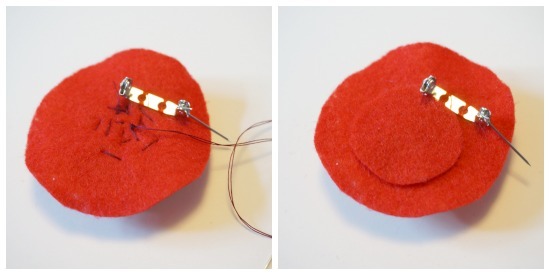 You may remember the felt holly pin I made over the holidays and the poppy brooch I created for Remembrance Day. 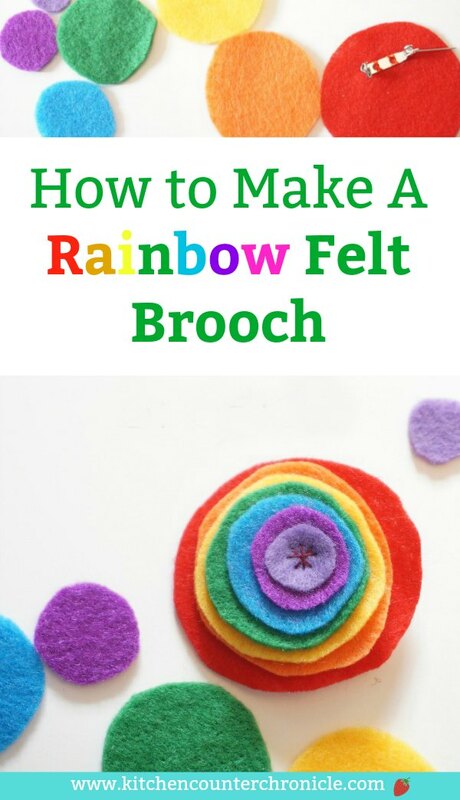 I find felt brooches an easy way to add colour and personality to an outfit. I wear my coat a lot. In fact, I see the moms and dads in the school yard more often in my coat than without. 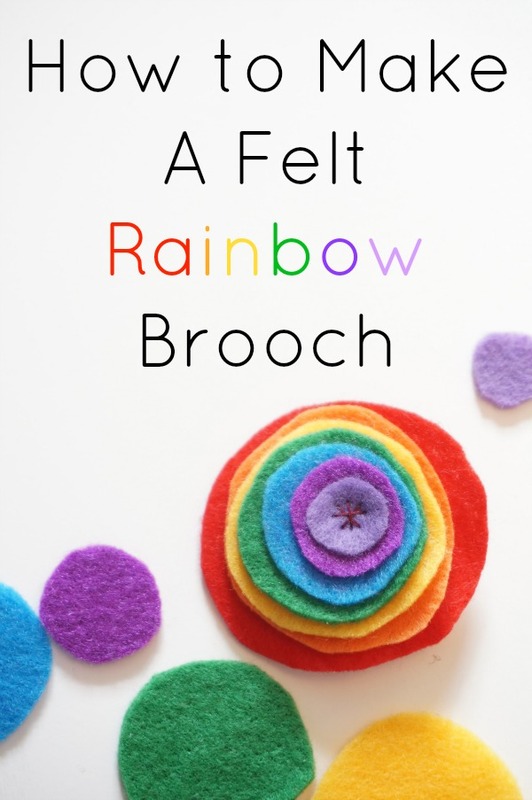 So, in an attempt to bring spring into our lives, I made these sweet felt rainbow brooches. I even made one for each of my daughters to wear…spread the sunshine. We began by gathering our supplies. Red and purple thread, needle, scissors, felt (red, orange, yellow, green, blue, indigo and violet), locking pin back, hot glue gun and a 2″ cardboard disc (I made this disc myself). 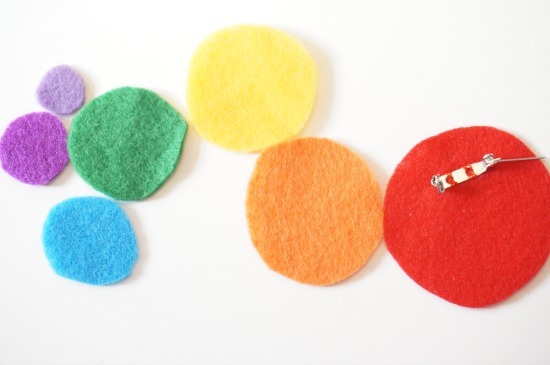 Once our supplies were gathered I started by cutting a 2″ disc of red felt…red is the outer colour in a rainbow. Once cut out, I then sew the locking pin back onto the upper third of the brooch. 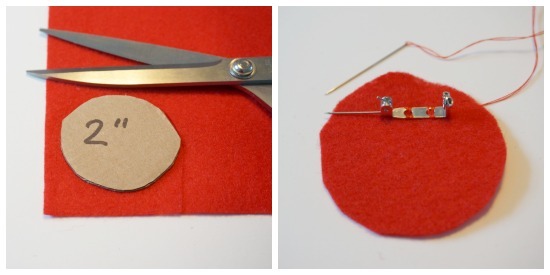 Position the locking pin back so that 2/3 of the felt is below it…thus the brooch will sit nicely on your coat. Then cut a disc of the rest of the colours of the rainbow. Making each disc slightly smaller that the previous. Be sure to follow the colours of the rainbow…red, orange, yellow, green, blue, indigo, violet. 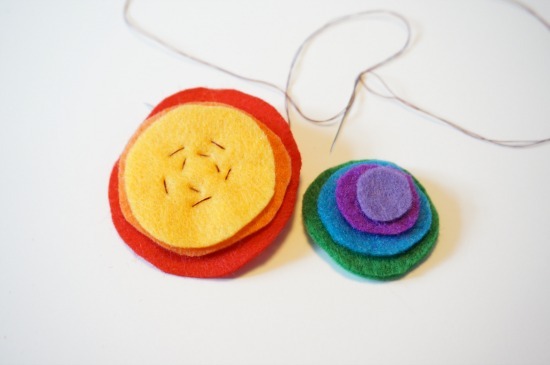 Or, create your own pattern of colours…as long as you make each disc gradually smaller the brooch will work. Once all of the discs are cut out, it’s time to sew them together. 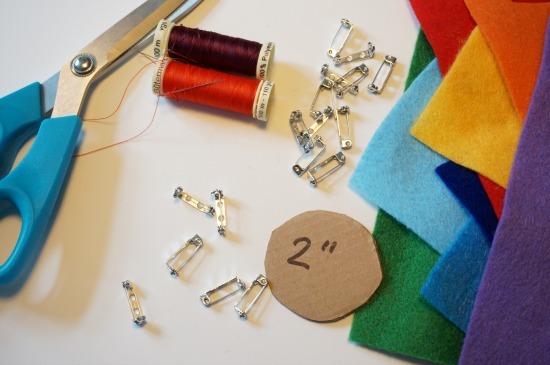 Place the largest three colours together (red, orange and yellow) and sew them together. Then add the rest of the discs on top and sew them in place. Try and be neat with the stitches that are showing on the smallest (violet) disc. These will be showing. I used my stitches to make a simple star. Also, be sure to knot the thread on the backside of the brooch…keep all knots on the red disc…this will be hidden. Finally, cut a small disc of red felt…about the size of the blue disc…and position it to cover all the stitches on the backside of the red disc. I used a hot glue to attach it in place, you could use fabric glue. This cleans up the look of the backside of the brooch. Once complete, this cheery little rainbow can be fastened to your coat, sweater, scarf, hat, hairband, wherever you like. Nature made the most delightful colour combination with the rainbow. Hope this brooch bring a little bit of spring into our lives. Looking for more fun crafts to make with your kids? love these, so amazingly pretty! LOVE this! SO cute and colourful and looks super easy too! Yep, I never know what is worse..snow or slush? These are so adorable. Sharing with my niece! This would be so fun for St. Patty’s day. Very cute! And you make it look easy, too!